Showing 1 - 20 of 587 results. 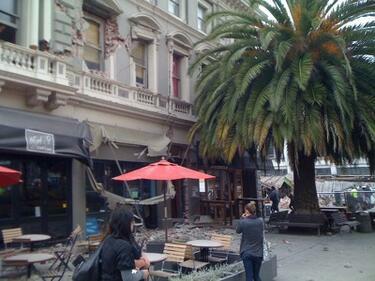 A photograph of the earthquake damage to Plume on High Street. 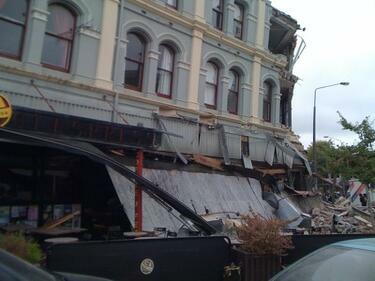 The awning has completely collapsed, along with the walls near the corner of the building. 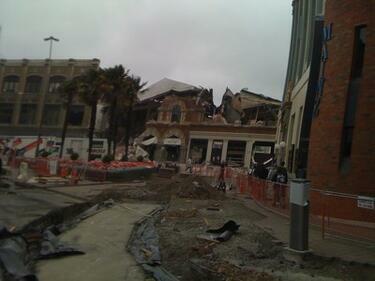 A photograph of collapsed buildings on Manchester Street taken shortly after the 22 February 2011 earthquake. 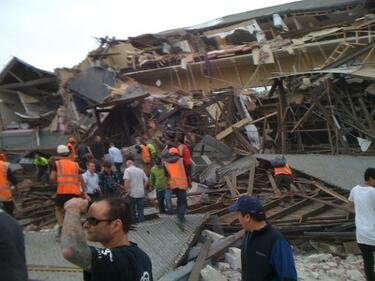 Workmen and members of the public are searching for survivors in the rubble. 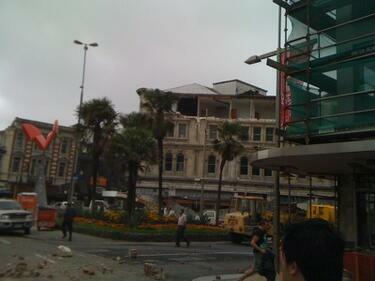 A photograph of the Excelsior Sports Bar building shortly after the 22 February 2011 earthquake. Bricks from the walls above have crumbled and fallen to the street, taking the awning with it. People can be seen below, examining the building and attempting to leave the central city. 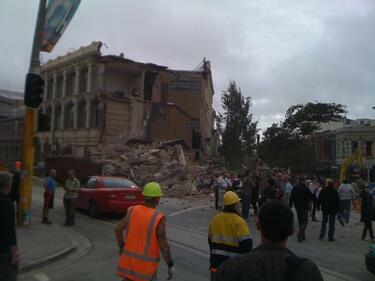 A photograph of the earthquake-damaged Ruben Blades Hairdressing Academy Building on Manchester Street. Crowds have gathered at the intersection of Manchester and High Streets after evacuating their buildings during the 22 February 2011 earthquake. 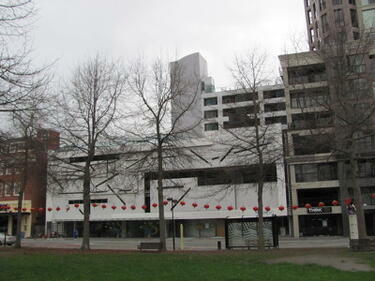 A photograph taken from Manchester Street of the earthquake-damaged Strange's Building. The third storeys walls have crumbled leaving the inside of the building exposed. 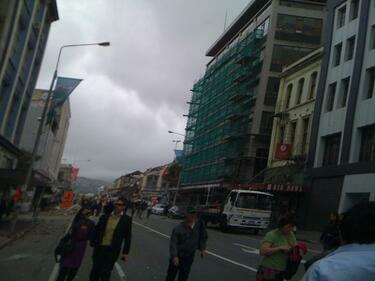 People can be seen walking along the street after evacuating their buildings during the 22 February 2011 earthquake. 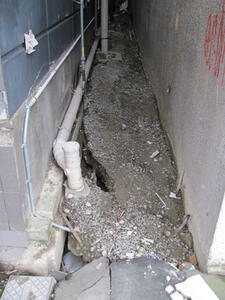 A photograph of the collapsed corner of the Ruben Blades Hairdressing Academy building on Manchester Street. Members of the public are searching for survivors in the rubble. A photograph of traffic leaving Lichfield Street taken from the intersection with Manchester Street shortly after the 22 February 2011 earthquake. A police officer is directing a crowd of people who have evacuated from buildings in the central city. A photograph of the earthquake-damaged Tower Chambers building on the corner of Lichfield and High Streets. The front of the building has completely collapsed. A crowd of people have gathered in front after evacuating their buildings during the 22 February 2011 earthquake. 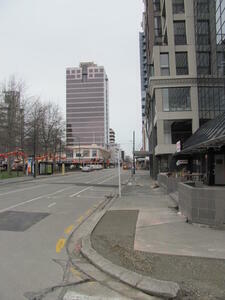 A photograph looking down Manchester Street towards the Excelsior Sports Bar. A crowd of people have gathered at the intersection of Manchester and High Streets after evacuating their buildings during the 22 February 2011 earthquake. 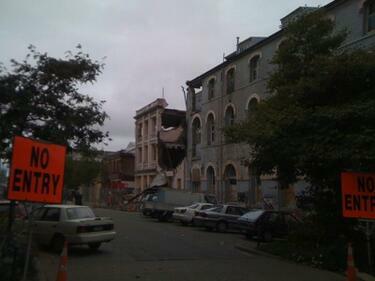 A photograph of the earthquake damage to the Domo furniture store on Tuam Street taken shortly after the 22 February 2011 earthquake. A group of people can be seen walking past the Alice in Videoland building to the right. 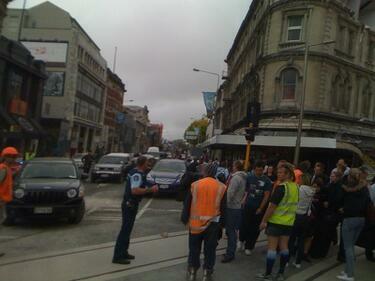 A photograph of members of the public walking down Manchester Street after the 22 February 2011 earthquake. 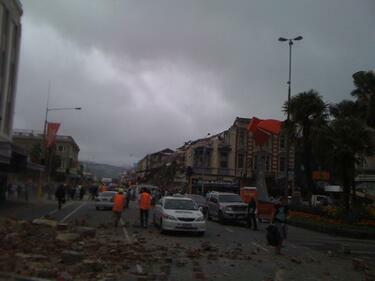 In the distance rubble from damaged buildings has spilled onto the footpath and road. A photograph of earthquake-damaged buildings on Bedford Row. Two 'No Entry' signs stand at the entrance to the street. 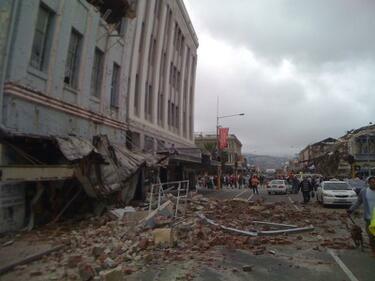 A photograph of earthquake-damaged buildings down Manchester Street. Crowds have gathered at the intersection with High Street in the distance, after evacuating their buildings during the 22 February 2011 earthquake. 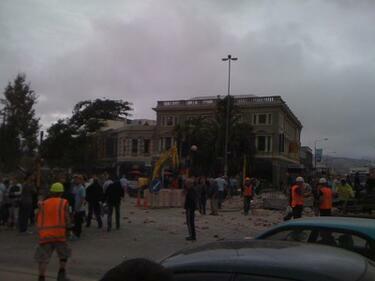 Rubble from the building to the left covers the road. A photograph looking north down Colombo Street, from the intersection of Armagh Street. 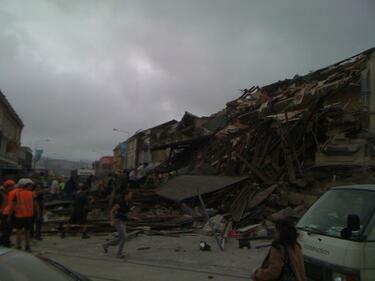 In the distance, rubble from the partially-collapsed Winnie Bagoes building can be seen on the road. 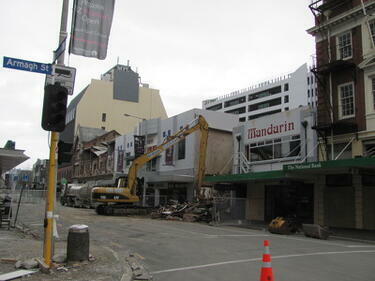 A photograph of an excavator demolishing a building on Colombo Street, taken from the intersection of Armagh Street. 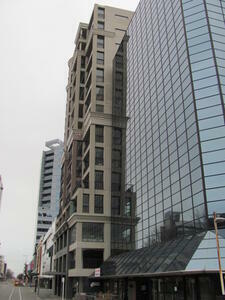 A photograph of buildings on Armagh Street, taken from the corner of Oxford Terrace. From the front, there is the Craig's Investment Partners House, the Victoria Apartments, and the Forsyth Barr building in the distance. A photograph of a person in a high-visibility vest and hard hat taking a photo of the Craig's Investment Partners House on the corner of Oxford Terrace and Armagh Street. 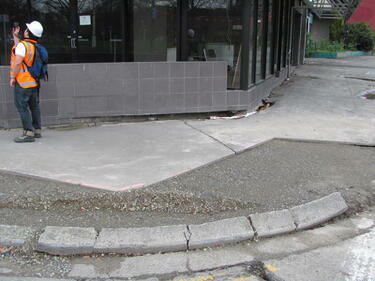 A photograph of unstable ground between buildings on Oxford Terrace. 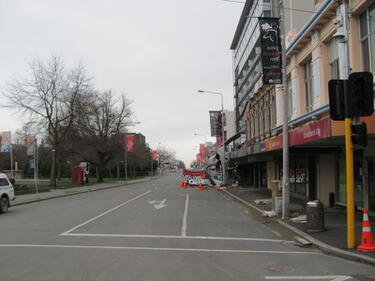 A photograph looking east down Armagh Street, taken from the corner of Oxford Terrace. In the distance, the PricewaterhouseCoopers building can be seen.